Each holiday season, the Case team engages in a little “friendly competition” with our annual Christmas Tree Decorating Contest. With a lineup of professional designers in our midst, elaborate entries are to be expected—but everyone who participates brings a high level of creativity and enthusiasm to the project. While the contest is a festive and fun tradition, it’s also an opportunity to give back to the community: Case donates the decorated trees to individuals and families who may not otherwise have them. 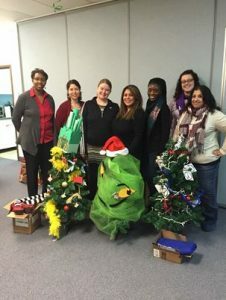 This year, trees were donated to the Clara Barton Center for Children and to families affiliated with Homestretch, a Virginia-based nonprofit that empowers homeless families with children to become self-sufficient. Homestretch staffers with Case trees. Case has been affiliated with Homestretch for several years through our Case Cares initiative. For several years, our team members have donated their time to rehabilitate kitchens in Homestretch’s transitional housing. Last year, we teamed up to build and donate 22 bicycles for children served by the organization. The competition was fierce, with themes including Minions, a snowman, The Grinch and Wizard of Oz. 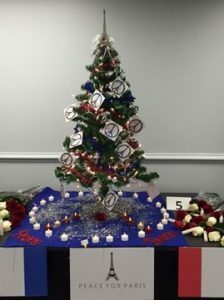 But the “Peace for Paris” tree triumphed over all – a beautiful tribute to France in blue, red and white, replete with candles and fresh flowers. Team members involved were Susan Matus, Loren Sanders, Maddie Millholland and Bill Millholland. Improving and enriching our community—whether through a multi-day renovation project or the simple act of donating a Christmas tree—is something we at Case value greatly.